HOUSTON – November 1, 2018 – Coats Rose, P.C., a leading business transaction and litigation law firm focused on development, has been recognized by U.S. News – Best Lawyers® “Best Law Firms” in 2019 for Tier 1 and 2 national and Tier 1, 2 and 3 metropolitan rankings across its offices in Houston, Austin, San Antonio, New Orleans and Cincinnati. The firm was recognized nationally as a Tier 1 firm for construction law and construction litigation and Tier 2 for real estate. Firms included in the 2019 Best Law Firms list are recognized for professional excellence with persistently impressive ratings from clients and peers. Achieving a ranking shows a unique combination of quality law practice and breadth of legal expertise. 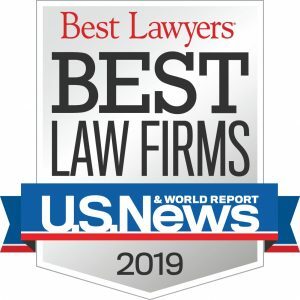 The U.S. News – Best Lawyers Best Law Firms rankings are based on a rigorous evaluation process that includes the collection of client and lawyer evaluations, peer review from leading attorneys in their field and review of additional information provided by law firms as part of the formal submission process. Clients and peers were asked to evaluate firms based on the following criteria: responsiveness, understanding of a business and its needs, cost effectiveness, integrity and civility, as well as whether they would refer a matter to the firm or consider the firm a worthy competitor. Coats Rose is a transactional and litigation law firm focused on development: the development of real estate, affordable housing, special purpose districts, business and private wealth. We provide legal counsel to businesses, governmental entities corporate and high-net worth clients across the U.S. and internationally. For over 30 years, the firm has leveraged its vast legal experience to fulfill clients’ needs spanning real estate law, affordable housing and community development, public finance, construction/surety law, commercial litigation, government relations, intellectual property, mergers and acquisitions, securities law, tax, wealth planning and preservation. In addition to its headquarters in Houston, Coats Rose has offices in Dallas, Austin, San Antonio, New Orleans and Cincinnati. Learn more at www.coatsrose.com.